Do science and politics mix? Video clips from the liberal-leaning Center for American Progress contrast GOP hopeful Mitt Romney's statements on climate change in June and October. GOP hopeful Mitt Romney slipped into scientific doublespeak this week when he told a rally that "we don’t know what’s causing climate change" — seemingly contradicting his earlier statement that "I believe humans have contributed" to the increase in global mean temperatures. That’s par for the course when it comes to the intersection of politics and science, says Shawn Lawrence Otto, who addresses the topic at length in a new book titled "Fool Me Twice: Fighting the Assault on Science in America." Otto said Romney is simply betting that he'll be able to zigzag away from his previous views on climate policy, in order to appeal to the Republican base during the primary season. "He's doubled down a little bit further," Otto told me today. Will Romney win the bet? It's hard to say at this point, but the fact that Romney is backing away from a view that has a fair amount of scientific evidence behind it doesn't bode well for the state of science policy ... and politics. "That is clear evidence to me of the level of anti-science among the Republican activists at the ground level," Otto said. The theme of Otto's book — that politics and science usually don't mix — isn't exactly a bolt from the blue. Other books in the genre include "The Republican War on Science" and "Unscientific America," as well as "Merchants of Doubt," "The Body Politic," "Denialism" and many more. But Otto draws upon his experience on the front lines of the debate over science and politics. And when I say "debate," I mean that literally. Otto's day job is in Hollywood, and he's perhaps best-known as the screenwriter and co-producer of "House of Sand and Fog" (and writer/director of the upcoming "Dreams of a Dying Heart"). But during the 2008 presidential campaign, he was the co-founder and CEO of Science Debate, a grass-roots effort aimed at getting the candidates to address the tough questions surrounding science and technology policy: What should be done about climate change? What about embryonic stem-cell research? How would you shore up American innovation and promote energy security and sustainability? Otto and his colleagues didn't get the full-scale, onstage debate they were hoping for, but they did get Barack Obama and John McCain to answer 14 key questions about the science-based challenges facing America. Otto thinks the candidates got as much out of the exercise as the voters did. "It's arguable that without that, Obama would not have had the science literacy that he had going into office," he said. Three years after Obama won the White House, Otto says the president's record on those science-oriented issues is a "mixed bag." There are questions about environmental compromises, a less-than-transparent regulatory process and renewable-energy reversals. for example. "We got on base, that's about all we managed to do," Otto said. "We didn't hit a home run." But the big problem may be the state of the electorate. In his book, Otto outlines how today's political framework is based on "values" rather than facts, and how that has distorted the debate over issues that touch upon science and technology. If anything, America has slid backward over the past few decades, Otto said. 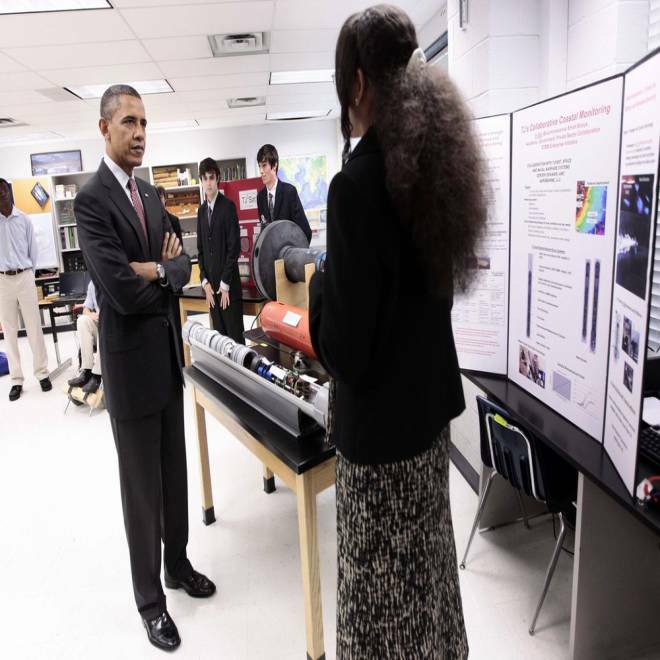 President Barack Obama listens to student Alexandria Sutton, 16, during his visit to a classroom at Thomas Jefferson High School for Science and Technology in Alexandria, Va., in September. "In the 1960s, John F. Kennedy had to go out of his way to say that his religion would not interfere with his presidency," he said. "Now we're almost having candidates say the opposite: They're not going to let the science interfere with their religious convictions while they're in office. ... It's not family values that made America No. 1. It's our can-do spirit and our ability to deal with hardheaded science." So what's the solution? Otto doesn't have any magic formula up his sleeve. "To me, the question is whether knowledge is advancing to the point where democracy isn't able to handle making good decisions," he told me. "What happens when the level of knowledge required around all these issues that we have to be able to salve is so high that the general public really doesn't intersect with it? I don't really know the what the solution to that is, but it's very concerning." He may not have the quick fix, but he does have some suggestions. For example, in the book he lays out an "American Science Pledge" that commits the signer to upholding scientific integrity and transparency, freedom of inquiry, open debate and policies based on knowledge rather than personal opinions. To his credit, Otto avoids blaming religion for the sad state of scientific affairs. "This is a time for churches to reach out to scientists and to speak about science and politics, because these discussions are so important to the future," he writes. "We are in a moral crisis, and it matters little whether a preacher is conservative or progressive if he or she is incorporating knowledge into moral reflections." Otto also calls upon scientists to get more involved in public engagement. "I do think that scientists have the opinion that it's not really their job, but I think that's a mistake," he told me. "Right now, the public doesn't understand what they're getting for their money, and they don't appreciate what they're getting for their money. So right now there's a growing science gap, and scientists are the only ones who can do something about that." You can bet these ideas will be coming to the fore during Science Debate 2012, which is just starting to get off the ground. How do you see the debate over science, technology, innovation and public policy shaping up? Feel free to weigh in with your comments below. Will our 'Sputnik moment' fizzle out? For more on the presidential campaign, check out msnbc.com's Politics section.